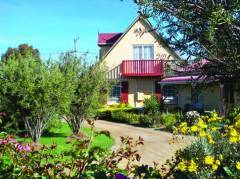 Swansea Cottages is situated in the historic township of Swansea on the central East Coast of Tasmania overlooking Great Oyster Bay and Freycinet National Park. Set in a unique village setting is your choice of well appointed suites or fully self contained 1,2 or 3 bedroom cottages offering quality and charm, combined with the homely comforts expected today. All are air conditioned with climate controlled heating and wireless internet.Each suite has a queen or twin bed, kitchenette, dining suite, ensuite, IDD telephone and Sony wall mounted LCD TV, video and DVD player. Cottages also have separate bedrooms and full kitchen and laundry facilities.Romantic 2 person Spa suite or cottage available. The property is adjacent the beach and 150metres north of the Post Office. 50 M to Historic Swansea Barkmill, Cafe/Bakery and Tavern, Walk to award winning restaurants, shops and attractions. A superb location and ideal base adjacent Freycinet National Park to base yourself for 3 to 5 days exploring IDD Telephone, Bicycle tennis courts and fishing rod hire.